Recognized as one of the country’s 83 doctoral research universities by The Carnegie Foundation for the Advancement of Teaching, Oakland University offers its more than 20,000 students opportunities to work directly on research projects with expert faculty who bring current knowledge right to the classroom. 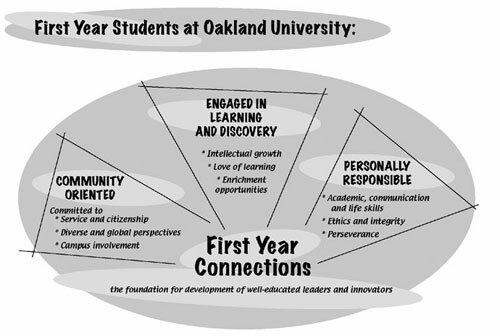 In all its activities, Oakland University strives to exemplify educational leadership. Anchored by a strong liberal arts program, the university is organized into the College of Arts and Sciences, schools of Business Administration, Education and Human Services, Engineering and Computer Science, Health Sciences, Nursing and The Honors College. The university’s full-time faculty, which numbers more than 600, has a distinguished record of research and scholarship. Faculty members have won some of the most prestigious awards made by government agencies and private foundations. Oakland received more than $39 million in grants and funding for research efforts across multiple disciplines in the 2017-18 fiscal year. Studies in biological and physical sciences and nondestructive testing attract national and international attention to Oakland University. Its highly recognized Eye Research Institute is the only major eye research center in the United States not associated with a medical school. The Center for Biomedical Research resides in the College of Arts and Sciences and facilitates collaborative biomedical research projects with core facilities and equipment. The Oakland University William Beaumont School of Medicine, Michigan’s first new M.D.- granting (allopathic) medical school in 47 years, earned full LCME accreditation and celebrated its first graduating class in 2015. Complementing its academic programs, Oakland University collaborates actively with business and industry to foster economic development and meet the demands of a highly educated workforce in southeastern Michigan. The university offers world-class cultural activities with emphasis on the professional performing arts. Meadow Brook Hall, former home of the university’s benefactors, is a National Historic Landmark and serves as an historic museum and cultural center. Affiliated with the Department of Art and Art History in the College of Arts and Sciences, Oakland University Art Gallery exhibits promise something new for art enthusiasts of all ages, interests and passions. Founded on Oakland’s campus in 1967, Meadow Brook Theatre is Michigan’s largest non-profit producing professional theatre. Meadow Brook Amphitheatre brings an annual summer program of world-class entertainment to campus. Located in suburban Oakland County, Michigan, Oakland University is easily accessible to millions of Detroit metropolitan area residents. Oakland’s relationship with its hometown communities enriches student lives. Through partnership efforts with the cities of Rochester, Rochester Hills, Auburn Hills, and Pontiac many internship opportunities are available to Oakland students and many merchants offer discounts for OU students, alumni and staff. Through OU-Macomb, more than 25 Oakland University degree programs currently serve nearly 1,100 students at the Macomb University Center, Macomb Intermediate School District and the Anton-Frankel Center. The Wayne State University Law School is the exclusive educational partner law school for Oakland University, making law school accessible to students from southeastern Michigan. Oakland University is a preeminent metropolitan university that is recognized as a student-centered, doctoral research institution with a global perspective. We engage students in distinctive educational experiences that connect to the unique and diverse opportunities within and beyond our region. Through faculty-driven and student-engaged research, scholarship, and creative activity, Oakland University advances knowledge and art in a diverse and inclusive environment. The University offers master’s programs that meet demonstrable needs of Michigan residents and that maintain excellence. Doctoral programs are offered that are innovative and serve needs that are not adequately met elsewhere in the state. Offerings in continuing education provide Michigan residents with high-quality coursework for professional development and personal enrichment. The University strives to remain current and relevant through an adequate program of continuing faculty development and the exploration of innovative schedules, methods, and curricular design in keeping with the various needs of its diverse students, many of whom commute, work, or are older than the traditional college-age student. Oakland University offers, and will continue to offer, only those programs for which adequate resources and well‑prepared faculty are available and for which a demonstrable need is expressed through the attraction of qualified students.